The NYC Health Department has come out with a strong new policy as they work to contain the current measles outbreak. 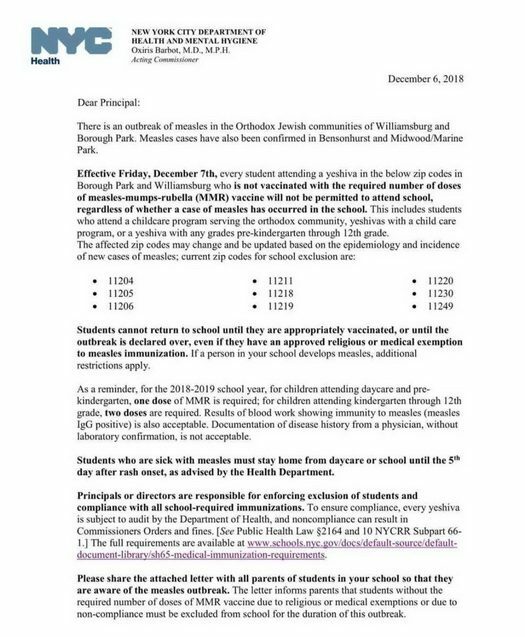 Part of the statement given to YWN reads “Effective Friday, December 7th, every student attending a Yeshiva in the below zip codes who is not vaccinated will not be permitted to attend school, regardless of whether a case of measles has occurred in the school”. Zip codes include: 11204, 11205, 11206, 11211, 11218, 11219, 11220, 11230, 11249 – Which is Boro park, Williamsburg, parts of Flatbush and other areas of Brooklyn. 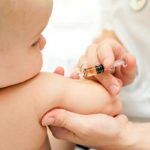 Just a few days ago, YWN spoke with Dr. Jane R. Zucker, the Assistant Commissioner for the Bureau of Immunization at the NYC Department of Health who said that there are now 39 confirmed cases. All of the cases are in Brooklyn – 15 of them are in Williamsburg, 21 are in Boro Park, 1 in Bensonhurst, 1 in Marine Park. “Besides for five cases being adults, the rest are all children under the age of five, Dr Zucker told YWN”. “The vast majority of these cases were unvaccinated, and many of these children could have been vaccinated and this outbreak could have been prevented”. Dr. Zucker told YWN that they suspect there are many additional cases that have not been properly reported. 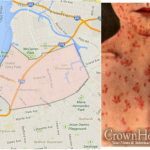 Meanwhile, Rockland County Health Commissioner Dr. Patricia Schnabel Ruppert told YWN that as of December 6, there are 89 confirmed reported cases of measles in the county. • There are now 18 confirmed measles cases. • There are also 7 potential cases under investigation. • Vaccination is encouraged and those children involved with exposure to a confirmed case may be subject to an order of exclusion, if unvaccinated. • The Ocean County Health Department continues to support and highly encourage the exclusion of non-vaccinated children from schools, preschools and daycares in the outbreak area. These entities have the authority to make that decision when an outbreak has been declared by the New Jersey Department of Health. The age range so far for the current outbreak is 6 months to 59 years old. In the City of Passaic, there are three confirmed cases in one household. Earlier on Thursday, YWN published that in the London UK Chareidi community there are at least 60 confirmed cases. There are also cases in Kiryas Joel in Orange County, NY. This is absurd. When I was a kid everyone got measles and it was no big deal. The Department of Health is out of control. When you were a kid thousands of kids died from measles, and thousands more were permanently injured. It was “no big deal” because there was nothing that could be done about it, so people accepted it as simply part of life, just as people used to accept that every family could expect to bury some children, and it was common for women to die in childbirth. As soon as people were able to prevent it they did so, and BH such deaths became rare, so now they are a big deal when they happen. The ones out of control are the parents who don’t vaccinate themselves and their children. These kinds of diseases would be nearly extinct, but when people choose not to vaccinate their children are essentially welcoming the preventable diseases into their lives allowing their children to become infected which could possibly KILL them. The masses should not have to worry and be punished because of the few. No vaccine no entry! That’s malarkey. If the vaccine worked the “masses” would have nothing to worry about. If the vaccine didn’t work there would be outbreaks everywhere not just in unvaccinated areas. The vaccine reduces the chances of acquiring the illness. B”H crown heights WASN’T included!!!! CH should be on here and I hope it gets added. Many schools in CH already do not allow. Legally the city could even forcibly vaccinate the children, and maybe it should. Certainly al pi torah the beis din would forcibly vaccinate the children and we would have no problem. I know of several cases of children who were affected by measles (either their mother contacted it while pregnant or child contacted it)- which resulted in total deafness and other disabilities. These diseases have serious consequences for the vulnerable. So what type of person takes it upon themselves to wave it away with their hand. I hope those people or their kids do not contact measles or suffer its consequences. The injections were created to save lives. Parents were very grateful when they came out. As a result many of these diseases were almost eradicated in many parts of the world. Now,we have an interesting turn of events. Frum Yidden are helping these disease to resurface!!!!! I hope they add 11213 asap. If the mother had gotten measels as a young child, she wouldn’t have to worry getting in pregnancy and her baby would immune while nursing! You are wrong. Thousands used to die from measles, even in developed countries. The vaccine is what eradicated it. And no, babies do not get immunity by nursing from mothers with antibodies. They need to be vaccinated too.